The Sleep Science 9" Natural Latex mattress by South Bay International is an all-latex mattress. In contrast with memory foam mattresses under the Sleep Science brand, which are also available through Electropedic, the 9" Latex and its PCMs-infused version, the 9" Latex GL, are currently sold only through Costco. Also, an Advanced Sleep Technologies version is not yet listed on Wayfair or other online retailers. According to the product descriptions, the basic material in the Sleep Science 9" Natural Latex mattress is natural latex. Commonly accepted usage would leave room for a blend of mostly latex from rubber tree sap with synthetic latex, but the description does at one point say "all natural," indicating no synthetic rubber content. The construction of the 9" Natural Latex mattress is simple: just two bonded layers and the cover. Both layers are composed of Talalay latex. The layers are bonded with a water-soluble adhesive. The bottom layer of the Sleep Science 9" Natural Latex is 6" of support level latex foam. This firm material provides basic support for the whole mattress, with a higher degree of resiliency than the comfort layer. The stiffer bounce of support latex holds the body weight of the sleeper while the layer above it does the cushioning. The 3" upper layer is not as firm as the support core. The naturally resilient latex does not leave the sinking feeling that memory foam has. But latex is pressure-relieving. 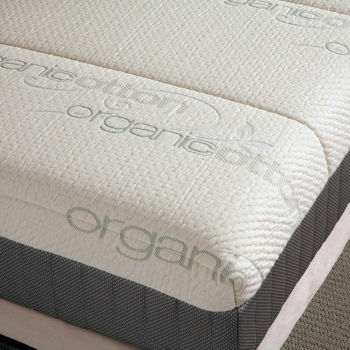 The cover of the Sleep Science 9" Natural Latex mattress contains organic cotton. The quilting includes wool as a fire retardant, eliminating chemicals. The Sleep Science 9" Natural Latex mattress is covered by South Bay International's 20-year limited warranty. Compatible foundations include platform beds, solid top bases, and adjustable beds, such as the Motion Trend by Sleep Science.